I still don’t have all of my 1099s (I thought they had to be sent out by January 31? ), but I want to get going on filing my taxes. 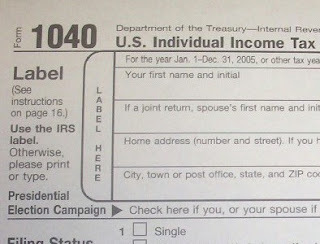 Fiance’s taxes are simple — one W-2 and a couple 1099s from bank interest. Mine is messy — two W-2s and income coming not only from interest at a number of banks but also from numerous freelance employers. So I’ve come up with all of the numbers I need by tallying that income so my father can help me with my taxes. Math isn’t my strong point. I’ve mocked up two different 1040s, plugging in the numbers using the standard deduction and personal exemption, and it appears I may actually get a small refund. That goes against my rationalization that because I had additional untaxed income this year over last (when I got a whopping $8 back), I would actually OWE money. So I’m looking forward to checking out the numbers more accurately with Dad tomorrow.